The Egyptian throne was usurped by the nomarchs of Heracleopolis (8th and 9th dynasties) during one century long civil war known as the First Intermediate Period, while the central authority completely collapsed. The pharaohs of the 8th and 9th dynasties consolidated their power in Lower Egypt but the nomes of Upper Egypt united under nomarchs of Thebes (11th dynasty) in 2134 BC and the clash between both lines was inevitable. The Theban line managed to gain the support of the nomarchs of the Middle Egypt, decisively defeated the Heracleopolitan kings under Mentuhotep II and reunited the Upper and Lower Egypt in 2040 BC which is widely considered as the beginning of the Middle Kingdom. Middle Kingdom reached its zenith under the 12th dynasty which was founded by Amenemhat I. Under his successors the Egyptians conquered Nubia, Sinai Peninsula and southern Palestine. 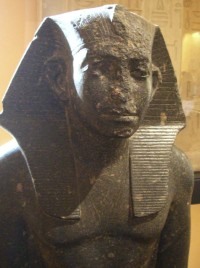 Senusret III, the fifth pharaoh of the 12th dynasty finally destroyed the power of nomarchs by replacing them with centralized administration. After the death of the last pharaoh in the 12th dynasty male line the Egyptian throne was assumed Sobekneferu who became the first female ruler of Egypt. Ancient Egypt was after her death ruled by numerous pharaohs of the 13th dynasty who rarely ruled more than 4 years. The 13th dynasty more or less consisted of military leaders or high officials who did not succeed to establish their authority. Rapid changes on the Egyptian throne resulted in the cultural decline as well as territorial losses: Sinai Peninsula, Nubia and Palestine, while eastern Nile Delta was invaded by Semitic peoples. Decline of strong central power resulted in the rise of a rival line (14th dynasty) in western Nile Delta but Egypt was invaded and subdued by Hyksos in 1650 BC.